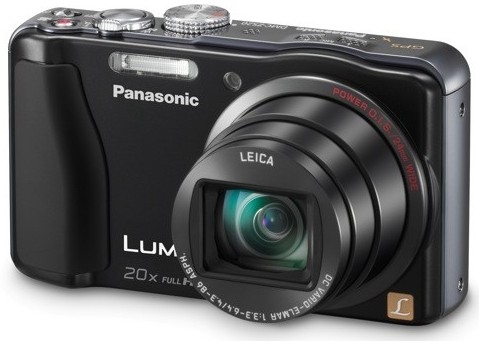 Panasonic today announced four Lumix cameras: Two travelzooms, and two rugged compacts. First up are the DMC-ZS20 (TZ30) and the DMC-ZS15 (TZ25). The ZS15 comes with a 14 megapixel sensor, a 16x optically stabilised 24-384mm equivalent f/3.3-5.9 lens, a 3" HVGA LCD, 1080i videos in 60 FPS in AVCHD. The ZS20 gets a 14 megapixel sensor, a 20x optically stabilised 24-480mm equivalent f/3.3-6.4 zoom lens, a 3" HVGA touchscreen LCD, 1080p videos at 60 FPS with a high speed 220FPS option at reduced resolution, and a GPS with a database of landmarks and maps that can be loaded from the included DVD. Both cameras bunch of special effects and in-camera software features (including a take on Sony's Sweep Panorama), burst mode of 10 frames a second, and full manual controls. The ZS20 will be priced at US$350, while the ZS15 will be priced at US$280. Both will ship in March. More photos and details at the link. Next up are the rugged cameras, the DMC-TS4 (FT4) and the DMC-TS20 (FT20). The TS4 replaces the TS3, and now has a 12 megapixel sensor, an optically stabilised 4.6x 28-128mm equivalent f/3.3-5.9 zoom lens, a 2.7" QVGA LCD, 1080i video at 60 FPS, and a rugged shell that is waterproof to 40 feet (12m), shockproof to 6.6 feet (2m) and freezeproof to 14F (-10C). There is also a GPS sensor, and has the same landmarks and maps capability as the ZS20 above. The lower-end TS20 has a 16 megapixel sensor, a slow optically stabilised 4x 25-100mm equivalent f/3.9-5.7 zoom lens, a 2.7" QVGA LCD, 720p video at 30 FPS, and a less-rugged shell that is waterproof to 16 feet (4.8m), shockproof to 5 feet (1.5m) and freezeproof to 14F (-10C). The TS4 will ship in March for US$400, while the TS20 will ship in February for US$180 (quite the price difference there). Photos and details at the link.